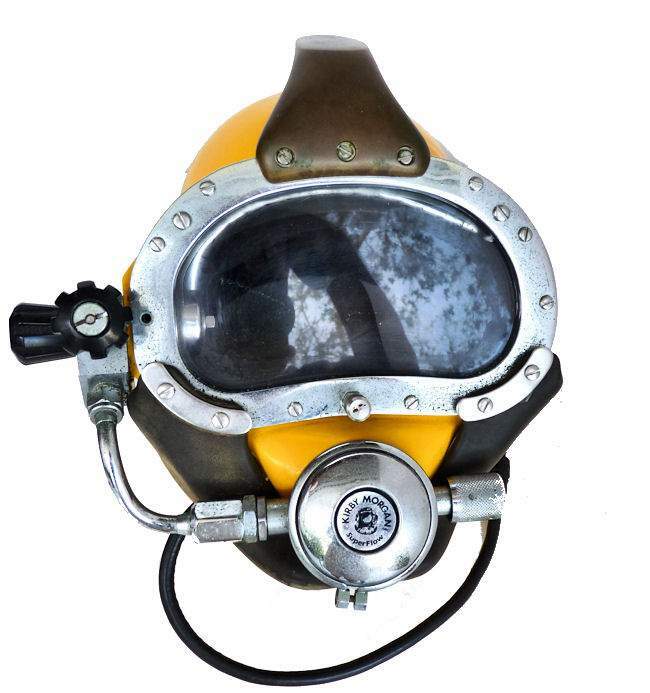 To view our current inventory of vintage dive helmets and gear, clck here! 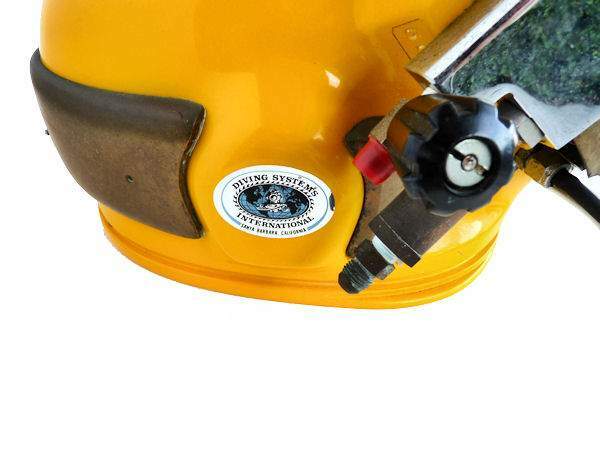 This Fine Helmet Has Been Sold to Canada. Thank you! 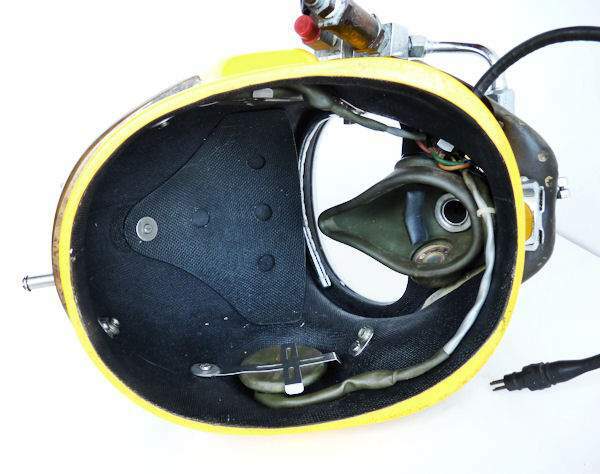 This helmet appears to be in good condition, but should be thoroughly checked out by the factory. 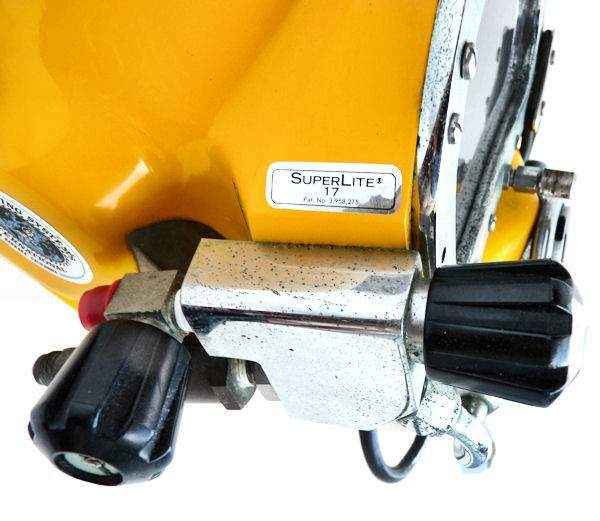 If you are looking for something special at an entry level price, this is the diving helmet for you. Presented is a Kirby Morgan Model 17 SUPER LITE, patent number 3958275, which we believe to be a Model A made in 1976. It's serial number is 5083. It comes from the collection of the former owner of a diving company with extensive overseas operations whose abbreviated resume is below. PROVENANCE: From the collection of a USMC 1st Force Recon veteran, who after serving two tours in Vietnam, and five years service, began a diving career that spanned four continents, and 20 years underwater experience before becoming a manager. The next years were spent as Oceaneering Manager of the Deep Diving Bell and Saturation Systems for a large diving company. In 1981, he founded his own deep saturation diving company specializing in 300+ meter / 12 man / split level operations serving the needs of such companies as PETROBRAS. His company holds the longest running safety track record in the world for deep diving operations to 300 meters, having performed more than twenty years of safe diving operations without a FATAL ACCIDENT. The dive support ship “Toisa Sentinel” under his supervision has performed more than 4000 saturation dives in deep water to 300 meters without a fatal accident as well. In 1994 his company mobilized another vessel with a 22 man split level saturation system on the Support Vessel Toisa Sentinel. His crew on the DSV Toisa Sentinel had been operating continuously performing 24 hour days,. Deep diving operation for Petrobras from 1994 until 2011. Selling his dive company in 2001, he continued with them until 2005, at which time he began a saturation diving consulting business in which he is active today. Missing the neck dam yoke! 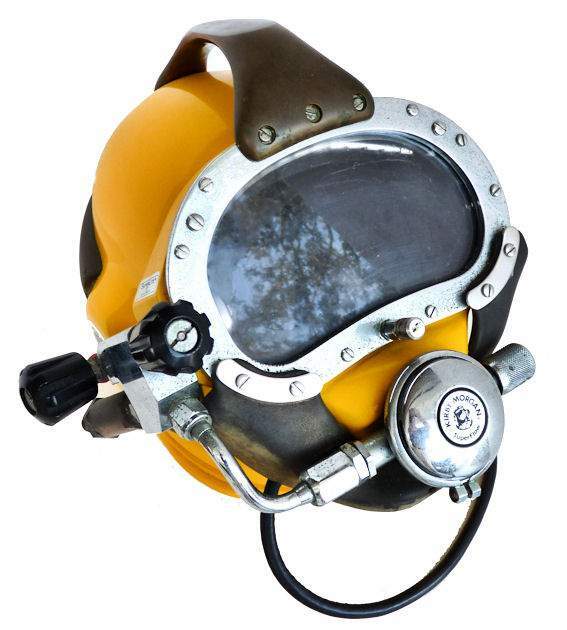 CONDITION: We specialize in vintage and antique dive helmets and not contemporary helmets such as this. Make special note that the neck dam yoke is missing and other parts might be as well. The interior is clean and has a new looking appearance. It is wired for communications and the speaker is present. It has not been tested. Except for some minor pitting of the chrome, there is little other evidence of use. International buyers welcome, but inquire first. We have satisfied customers in Argentina, Australia, Austria, Belgium, Bermuda, British Virgin Islands, Canada, Chile, China, Czech Republic, Democratic Republic of Congo, Denmark, Estonia, England, France, Germany, Greece, Holland, Hong Kong, Hungary, Iceland, Indonesia, Ireland, Israel, Italy, Japan, Kuwait, Latvia, Luxembourg, Malaysia, Martinique, Mexico, New Zealand, Nigeria, Norway, Nova Scotia, Panama, Poland, Portugal, Puerto Rico, Romania, Saudi Arabia, Scotland, Singapore, Spain, St. Maarten, Sweden, Switzerland, Thailand, Turkey, United Arab Emirates, USVI and the Eastern Caribbean.